In the interest of accuracy – our watchword here in the offices of Once Upon a Time in the Vest - we have to start by making a correction regarding Henry Carr's successive 220 yard world records described in last month's issue. It seems that his 20.4 will not be submitted for a record, because his lane measured 18 inches short. A surveyor got to work on that right away and the measurement was correct four days later when he ran 20.3. March 30 finds us in San Angelo, Texas for the appropriately named San Angelo Relays where once again Jerry Dyes displays his amazing range of talents. He wins both the javelin at 248-11 and the broad jump at 24-10½'w, places fourth in the shot put at 50-5 and leads off the winning Abilene Christian 440 relay. Thanks to Jerry, ACC nearly doubles the point total of Texas A&M, 60-30 ½. On the same page there is a photo the multi-talented Jerry Dyes. That's the good news. The bad news is that he is misidentified. There are two closeups, side by side. 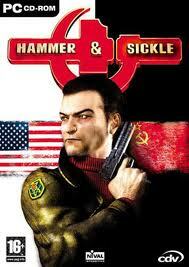 On the left is a swarthy gentleman with a hammer and sickle badge on his singlet. He is identified as “Jerry Dyes, versatile Abilene Christian field event ace”. On the right is a bright eyed bespectacled youngster, just the sort of young man you would feel good about having your daughter date, gripping a javelin, who is identified as Valeriy Bulishev, Russian 800m star who made the indoor tour”. After a lengthy conference of editors, reporters, staff assistants, correspondents and outside experts, we here at OUTV have come to the conclusion that the photos are reversed. In early April, Stanford, San Jose St. and Oklahoma had a triangular meet at Stanford. In reality it was a dual meet between Stanford and San Jose, with Oklahoma caught in the middle. The Sooners had run at Arizona St. on the previous Tuesday night, then at Arizona on Thursday night , and finally at Stanford on Saturday afternoon. A bit much in anybody's book. That's the way Spring break was spent in those days. The youtube site shows a bit of the 2 mile run that included Jeff Fishback and Danny Murphy of SJS and Harry McCAlla of Stanford. McCalla had won the mile that day in 4:04, went on to win the 2 mile in about 9:04 over Murphy and Fishback. You can see in one brief moment Payton Jordan running over to the pack to encourage the Stanford runners. I don't know who the other Stanford runners are. The two Oklahoma runners were David Hayes and John English. Also on April 30 the Easter Relays are held in Santa Barbara where Arizona State takes a determined shot at the college mile relay record of 3:07.2 it set last week. This time everyone is fresh. This is each runner's only race of the day. Mike Barrick leads off in 47.9. The pace picks up on the second leg as Henry Carr tours the track in 45.3. Ron Freeman and Ulis Williams finish up in 47.1 and 46.0 and the new record is 3:06.3. Makes one wonder what April, May and June might hold. C.K. Yang tops George Davis and Dave Tork in the vault 16-0½ to 15-6 both and is named the outstanding performer. Dave Davis is back on the scene. His 61-3 tops the 59-8 of Jay Silvester in the shot. Silvester doesn't go away empty handed as he wins the discus with a toss of 194-2½, ll feet ahead of Rink Babka. The following weekend, April 6, sees the Texas Relays befouled by bad weather. Three inches of rain fall in 24 hours and the Friday night portion of the meet is moved to Saturday. Times suffer as the track is slow and the sprints and hurdles are run into an 8 mph wind. Fred Hansen is not discouraged, however, as he chalks up his first 16 foot vault. The surprise of the meet comes in the mile where Dyrol Burleson follows Bill Dotson for three laps then bursts into the lead only to be passed in the home straight by Emporia State sophomore John Camien whose 56.2 last lap brings him home three yards ahead of the 1960 Olympian in 4:02.6. See the finish of this mile by clicking on this address on the youtube link that follows. Even John Camien has never seen this clip, as fuzzy as it is. It has been in my home movie collection for 50 years. I've set it on slow motion as it is just the last 40 or so yards. Bill Dotson can be seen following in the all white uniform. If anyone knows John, perhaps they can inform him of this site. Ed. No report of this meet would be complete if it didn't mention the dominance of Texas Southern University in the college division. The Tigers win the 440 relay, 880 relay, mile relay, two mile relay, sprint medley and the distance medley. There are no others. The first three are faster than run in the university division. John Pennel's outdoor PV world record of 16-3 reported last month in the “Late News” section is the front page story along with Carr's 220 record. The smiling Pennel is pictured with a pole on his shoulder, wearing the distinctive – okay I'll say it, ugly - Northeast Louisiana State tee shirt type top. (Frankly, this reporter thinks those shirts may have been the reason the Styron twins transferred.) for more on the Styron's see story at the end of this post. ed. At the bottom of the page is a brief story entitled “Pennel Ups Mark to 16-4”. The story is only eight lines. The meet was in Natchitoches, Louisiana on April 10. The only additional information is the John P'Red in the broad jump as well that day, going 23-4¾ and hurting his back in the process. Five pages of this issue are devoted to the US Report, a listing of the top ten marks for each event. We'll give you the top one or two. 100: Dennis Richardson of ACC 9.3, 220: Henry Carr 20.3, Bob Hayes 20.5, 440: Ulis Williams 46.4, Rex Cawley and Bob Tobler 46.5, 880: Ernie Cunliffe 1:49.0. 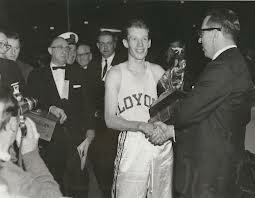 Mile: Keith Forman' 4:00.1, Harry McCalla 4:01.5 Two Mile: Charley Clark 8:49.0; 120 HH: Willie May 13.8, Ralph Boston and Brian Polkinghorne 13.9; 330 IH: Jim Miller 36.2, Dee Andrews 36.5; HJ: John Thomas 7-2, Lou Hoyt 7-0½, Joe Faust 7-0¼; PV: John Pennel 16-4, Fred Hansen 16-1, Gerald Pratt and CK Yang 16-0½; BJ: Ralph Boston 26-6; TJ: Pete Danna 51-2¾ (Boston 5th at 49-6½); SP: Dave Steen 61-8¾, Dave Davis 61-8½ (O'Brien 6th at 58-11¼); JT: Larry Stuart 267-3; HT: George Frenn 196-4; 440R: Texas Southern 40.7, Arizona State 40.8, Kirkland State (now Truman State) 40.9; 880R: USC 1:24.9, Arizona State, So Cal Striders and Texas Southern 1:25.0; Mile Relay: Arizona State 3:05.9 note: this breaks ASU's WR of 3:06.3 covered in this report, but there is no reference to where or when this was run. We do have splits: Barrick 47.8, Carr 45.5, Freeman 46.6, Williams 46.0. No other information is available. 2MR: Occidental 7:29.0, USC 7:29.2; Sprint Medley: Texas Southern 7:20.1; Distance Medley: San Jose State 9:47.6, LATC 9:48.0, Stanford 9:48.2; The 3 Mile only has one time, Ned Sargent's 13:53.8 and the 440IH (yes, yards) have only 4 times with the note that they are 440 times less 0.3. Go figure. The initial draft produces a permanent team which is supplemented by additional monthly or yearly drafts. Players can draft high school kids and potentially reap the benefit years down the road. There is a limit that each player can have although this appears to be variable depending on the league. When you draft an athlete, you have to drop one. More guideline minutia is involved, but you get the idea. You also get the feeling that Cordner doesn't get out a lot. A couple notes from here and there: Bob Hayes' 9.2 will not be submitted for world record status. The starting pistol was of too small a caliber. No further information is supplied. Bet someone is embarrassed....20 year old Joe Faust is retiring and giving up his spot on the Pan Am team roster....Remember when colleges had dual meets that really mattered? This reporter remembers numerous runs with a buddy over the years that were spent doping out the UCLA – USC dual meets. Here are a couple duals reported in this issue that must have been fun. USC wins the mile relay to top Stanford 73-72. Despite CK Yang's 16-0, 14.1, 226-4½ and 24-5½, Oxy tops UCLA 74½ to 70½......These meets are close, but we can give you even closer. How about the 72-72 tie between Abilene Christian and New Mexico? That only adds up to 144 points, one short. What happened? It seems that only the two ACC vaulters made the unmentioned opening height. Had the Lobos had a vaulter just clear a height, the meet would have been theirs. This is where OUTV's vast source of expert correspondents comes into play, specifically Pete Brown of Plano, Texas, who as alert readers are aware, has furnished us with his copies of T&FN for 1963. Pete ran in this meet. He tells us that the Lobos' vaulter, Don Beattie, would have easily cleared the opening height of 12-6, but he was sidelined with a sprained his knee. The two teams will meet again May 20 and we will be there to record the action. The 58th Annual TSU Relays are right around the corner (March 20-21) at the Alexander Durley Sports Complex on the campus of Texan Southern University. Just the mere thought of the relays conjures thoughts of years gone by when the event was one of the nation’s premiere track & field meets, featuring some of the fastest athletes in the country. From Olympians to world record-setters they all came to Third Ward to race at TSU. 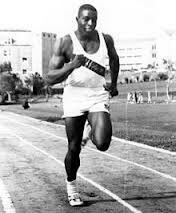 Names like: Bob Hayes, Charles Frazier, Homer Jones, Jim Hines, Rod Milburn, Carl Lewis, Leroy Burrell and countless all competed at the TSU relays. The TSU Relays. Throughout the sixties and seventies, the men’s track teams at Texas Southern, under the direction of track coach Stan Wright, were some of the most prolific teams in the country. The TSU track team was known as the Flying Tigers, but in 1961 a unique element was added to the Tiger repertoire, that truly legitimized that moniker. 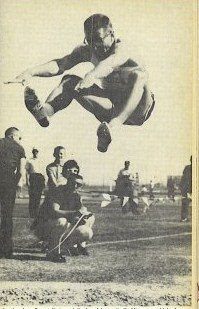 Galveston born and Los Angeles raised, Gerald Pratt came to Texas Southern and began to compete for the Tigers in 1962. What made Pratt so unique? He was an African-American who excelled in the pole vault! Pratt arrived to the Cleburne street campus after making a name for himself nationally at Los Angeles City College. Of course, regardless to where he was, Coach Wright had an eye for talent. The fact that Pratt was Black and one of the world’s top vaulters is itself somewhat of a miracle and a testament to African-American ingenuity. “We started in my backyard in Los Angeles. Myself, my brother Matt and some neighbors started off high jumping,” Gerald explained. “We got to a point where we had jumped as high as we could go, so we grabbed a metal pole in the garage and started using it to see how high we could go. A coincidental brush with athletes from the University of Oklahoma sealed the pole vaulting deal for an impressionable young Gerald Pratt. 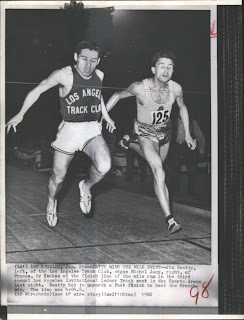 Gerald Pratt attended L.A. City College and his dominance in his event continued, amazingly enough, with little to no formal pole vault training and being left handed, which was extremely unorthodox for the event. 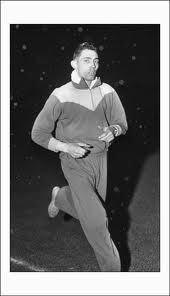 At Texas Southern, Pratt was an integral part of the TSU track juggernaut in the’60′s, a team that was second to none. Pratt recalls the TSU Relays in the sixties as being a meet that attracted star power from all over the country. Pratt became the first person in state history to ever pole vault 16 feet and at one time was ranked as high as No. 7 in the world, all while representing Texas Southern. An unfortunate back injury curtailed his 1964 season, yet he was still selected as an alternate for the 1964 Olympics in Tokyo, Japan. A subsequent back surgery ended Pratt’s track and field career. from the Louisiana Sports Hall of Fame. Don and Dave Styron or is it Dave and Don? When he won three gold medals in the 1956 Melbourne Olympics, sprinter Bobby Morrow relied on getting 11 hours’ sleep a night to keep up his strength. Four years later, twin brothers Don Styron and Dave Styron used the same strategy to rank among the world’s best athletes in the specialties. They might have a combined total of 11 hours’ sleep before major meets – 5 1/2 apiece for Don and Dave. Lew Hartzog, who coached the Styrons at Wheat Ridge, Colo., High School and Northeast State College (Northeast Louisiana University, Univ. of Louisiana-Monroe) was a great track coach, but he didn’t exactly run a tight ship. Any of his athletes would’ve had a hard time matching their coach’s reputation as a free spirit. When Hartzog took the Styrons and Dyes to the 1960 Olympic Trials at Stanford by automobile, they were on the road for four weeks – with a two-day layover in Juarez, Mexico, highlighted by Hartzog’s leap from a second-floor balcony into a motel swimming pool. “Looking back,” Dyes recalled when the Styrons were inducted into the Louisiana Sports Hall of Fame in 1977, “I don’t think stopping in Juarez was a very good idea." In the Olympic Trials, the field for the 400-meter intermediate hurdles was the fastest ever assembled. 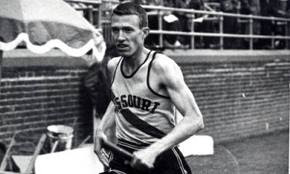 It included world record holder Glenn Davis, the defending Olympic champion, and the other two medalists in the Melbourne Game – Eddie Southern and Josh Culbreath. Whoever qualified for the U.S. team would be part of another 1-2-3 sweep in Rome. Don Styron, running the event for only the sixth time in his life, had a personal best of 49.9. Leading the pack at 300 meters, he hit the eighth hurdler and lost his balance for a few strides. “I lost my concentration, and wasn’t able to get my rhythm back,” he recalled. Despite the mishap, he finished sixth with 50.3 – one-tenth behind Culbreath. Davis won in 49.5 and the next three broke 50 seconds – but Southern, Culbreath and Styron didn’t make the team. The following spring, Northeast won the Florida Relays as Dave Styron won the 100, Don Styron won the high hurdles and both ran on winning 440-yard and mile relay teams. The Indians rolled up 50 1/2 points to 28 for runner-up Florida. When Northeast beat LSU’s Southeastern Conference champions 55-53, the Styrons accounted for 36 points. Don Styron had a personal best in the high hurdles that day, beating Dickie Durham of LSU with 13.9. Later in the 22-yard low hurdles, he lowered the world record to 21.9 seconds. The 220-yard low hurdles was a standard collegiate event at that time, but it was dropped in favor of the 440-yard intermediate hurdles. Two years in a row, Track and Field News selected Don Styron as the world’s best triple hurdler – combining the 120-yard highs, 220-yard lows ad 440-yard intermediate hurdles. He was the national AAU champion in the 220-yard lows in 1961, the next-to-last time the event was held in a national meet. Don Styron won his first race with his younger brother on March 18, 1940, when he was born 20 minutes before Dave. The twins played football and basketball at Wheat Ridge, Colo., and also participated in track and field. But they enjoyed only modest success. In the 1957 state meet, Don Styron was second in the 180-yard low hurdles and Dave Styron was third in the broad jump (now the long jump). When Hartzog got the Northeast job a couple of months later, he located the Styrons working on a summer job at hay and cattle ranches near Jackson Hole, Wyoming, and gave them the only scholarship offer they received from a four-year school. At Northeast, they had to build a track before they could build one of the nation’s best collegiate teams. “We had to borrow hurdles from Neville High and practice on the football field,” Don Styron recalled. Social barriers also blocked their development as world-class athletes, because a Louisiana law did not allow state schools to participate in integrated events at that time. That prevented Northeast from winning national titles, and cut down on its athletes’ opportunities for top competition. The Styrons shared Gulf States Conference “Athlete of the Year” honors three years, leading the school to its first three conference titles in any sport. Two years after he completed his collegiate eligibility, Don Styron tried to come back and win a berth on the 1964 U.S. Olympic team. In the 400-meter intermediate hurdles, he was runner-up to Eddie Southern in the Texas Relays and runner-up to Cliff Cushman in the Kansas Relays. But the Amateur Athletic Union offered little of no help to world class athletes after their collegiate eligibility expired, and his comeback bid ended in frustration and failure. He was able to fly to Corvallis, Oregon, for a qualifying meet, and finished second. But he ran out of money, and the AAU officials – who promised per diem expenses to the top three in each event – said they would mail a check. 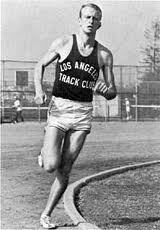 Meanwhile, Don had to hitchhike to Los Angeles – where Southern Cal coach Jess Mortensen allowed him to stay in the athletic dorm while he trained with USC athletes, and then hitchhike across the nation to compete in the Olympic Trials at New Brunswick, N.J. But the time he arrived in New Brunswick, he had lost his conditioning and finished last in a qualifying heat. More than 25 years later, he was still waiting for the check. teammate, Bill Crothers, is taking aim at Peter Snell's 2:06.0 1000 yards WR. Running from the front, he barely misses, finishing in 2:06.4. In second with a new American record is Missouri's Robin Lingle who runs 2:07.6. There is a notable mile as well. Jim Grelle vs. Tom O'Hara with Bill Dotson thrown into the mix. The field follows a rabbit through a 58.9 quarter before O'Hara is forced to take over. The next quarter slows to 2:01.2 before the pace rallies a bit at 3:02.5. At this point O'Hara leads with Grelle and Dotson right on his heels. When the gun sounds on the tenth and last lap Grelle moves wide to pass and nearly allows Dotson the inside advantage, but they are only running for second place as O'Hara moves away easily to win 3:59.5 to 3:59.8 for second place Grelle and third place Dotson. The next evening, Saturday, March 9, finds us in Milwaukee for the USTFF meet where 19 year old Brian Sternberg from the University of Washington separates from himself from former WR holders John Uelses and C.K. Yang by clearing 16-3½ to set the American record.His vast potential is demonstrated on his second try at a WR height of 16-9½ as he just brushes the bar off with his chest. .If outdoors ever happens in the Finnish climate. Other items in this issue include the headline, “Another Double by Dyes”. It seems that at the West Texas Relays held March 16 in Odessa, the amazing Jerry Dyes has won his third javelin – broad jump double in as many weeks, throwing 244-2 and jumping 23-9½. The previous week in the Border Olympics in Laredo, he posted marks of 240-3½ and 24-0, efforts that, along with leading off the winning Abilene Christian 440 relay and placing fourth in the 100 at 9.8, earned him the meet's outstanding athlete award. There is a pretty good high school athlete in Texas who may bear some watching. He is 6-6, 220 pound Pampas HS senior Randy Matson who last year showed promise with shot and discus marks of 64-7 and 186-6. As a senior he has spent his time playing football and basketball, sports in which Texas sports writers have confirmed that he is “above average”. While no specifics are given for football, “above average” appears to be a term applied loosely in basketball as he was voted to the Texas AAAA all state team and lead the state in rebounding with 18.2 a game. This season, after one day of practice, he has thrown 64-1¾ and 188-7½. We'll keep an eye on this kid and see if he improves.Matson will go to Texas A&M, but the U. of Oklahoma can't be faulted for not trying to get him to Norman. They gave scholarships to two of Randy's buddies from Pampa hoping Randy would decide to attend OU. I just got off the phone with Ernie Cunliffe and he suggested I contact you. Yesterday I placed a call to George Mattos, and sadly found out he died in October 2012 of prostate cancer. There is a good article about George's passing and life on Google. I talked to George's wife Lorraine, and we had a wonderful conversation about the life of this great guy. For the record, in the "steel pole era" Mattos is credited with the greatest clearance over pole grip height, 3 feet 1 inch plus. He really got vertical! 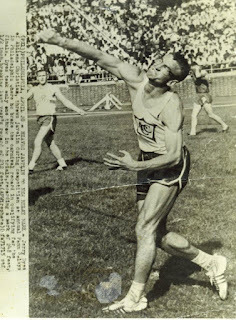 I consider him the greatest "clutch" vaulter I competed against---his best two vaults come in the 1952 and 1956 Olympic trials and he made both teams. I went on to do some checking and found the article Bill mentions It was printed at the time of his passing in George's hometown paper, The Santa Cruz Sentinel. Though George had moved away from there a long time ago, they certainly had not forgotten him. 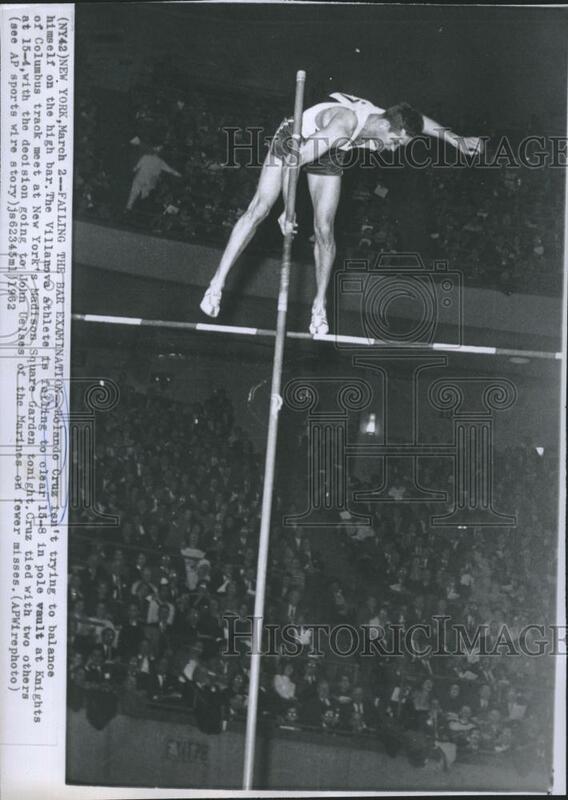 Strangely about the only thing my memory retained of the pole vault in Melbourne in 1956 was some news film of the Greek pole vaulter George Roubanis who took the bronze medal from George Mattos while he (Roubanis) used a fiberglass pole. As mentioned below this was the first medal won on fiberglass. I'm not very knowledgeable in matters of the pole vault, but I lived with several good jumpers in the early 60's when fiberglass was coming in big time. I've also recently spoken to Coach John Mitchell who had the first high school sixteen footer Paul Wilson. We'll be discussing that conversation in a future post on this blog. Of note, George Mattos won the California State high school meet on bamboo, then switched to steel. In winning the state meet he defeated the future actor Robert Culp who co-starred with Bill Cosby in the series "I Spy". I've found a sequence of stills from that TV series in which Culp uses his knowledge of the pole vault to play a scene. Of interest too is that George Mattos made a career as a jazz musician, and even declared that he had no interest in the sport or at least teaching vaulting as music filled his life. Marty Liquori is also a jazz musician. Several other actors have had major track and field backgrounds. Bruce Dern was a serious runner in the 60's, and Dennis Weaver who played Chester in "Gunsmoke" and "McCloud" was an excellent decathlete, and we should not forget Rafer Johnson did a bit of acting after his track career. Don Bragg the 1960 pole vault champion at Rome had dreams of playing Tarzan, but he was never able to parlay his pole vault gold medal into a movie career. 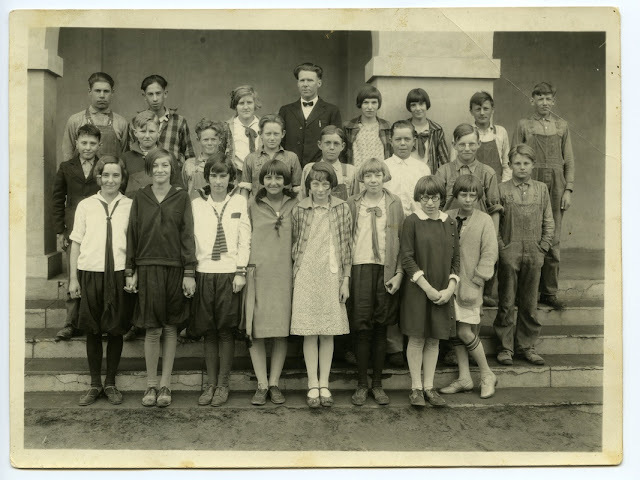 If you can think of some others, please write to me at georgebrose@yahoo.com In looking up information on George Mattos, I came across a grade school picture of Cornelius Warmerdam which I'm including at the end of this posting along with a brief bio written by the alums of his school. But above all this posting is meant to honor George Mattos. 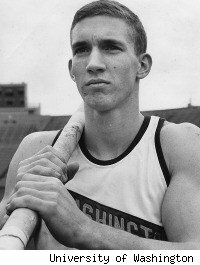 George Mattos, a two-time Olympic pole vaulter and Santa Cruz native, died Thursday in Oregon after suffering from prostate cancer, family members said. He was 83. Mattos, a San Jose State University graduate, finished ninth in the 1952 Helsinki Games and fourth in Melbourne four years later. Afterward, he spent more than three decades as a music teacher in Weed. He lived in southern Oregon for the past 20 years, and had attended every U.S. Olympic track and field trials since 1992 until last summer. "I didn't feel well enough this time," he recently told the Mail Tribune of Medford, Ore. But Mattos watched the London Games at home. "I know the feeling you get deep inside, that unbelievable joy," he told the newspaper. "There is just nothing like it." Born in Santa Cruz in 1929, Mattos grew up in Campbell where his grandparents owned a fruit ranch. He moved with his family to the Monterey Peninsula when he was 12. Mattos graduated from Pacific Grove High, where in 1947 he won the state championship in the vault using a bamboo pole. He out-leaped Berkeley's Robert Culp, who later became a well-known actor. 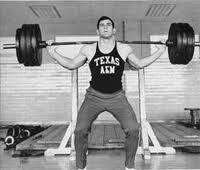 Mattos recalled how working on the family ranch gave his 5-foot-10-inch frame the upper-body strength to vault. Part of his chores included lifting boxes of apricots and prunes "doing weightlifting all those years but I didn't realize it." The accomplished clarinet and saxophone player majored in music at San Jose State while training under legendary track coach Bud Winter who would go on to tutor famous Speed City runners John Carlos, Lee Evans and Tommie Smith. 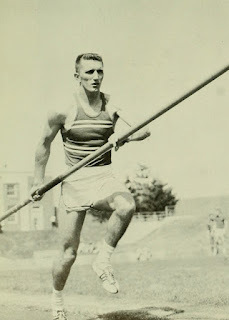 Mattos, a member of the Pole Vault Hall of Fame, was overshadowed by American Bob Richards during his era although he was ranked among the world's top 10 vaulters for a decade. 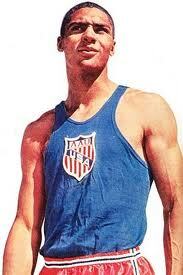 Richards won consecutive Olympic gold medals in 1952 and '56 and a bronze medal in 1948. Richards also was the first athlete to appear on the front of a Wheaties cereal box. 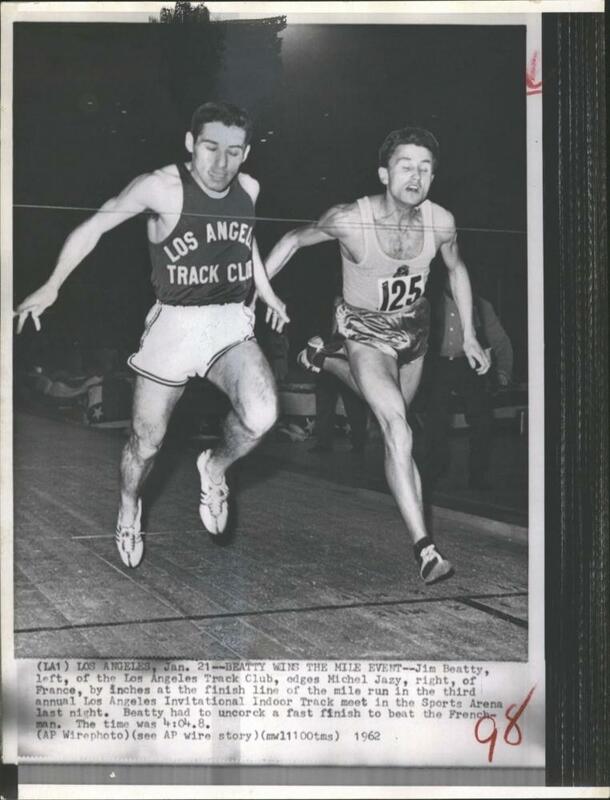 Mattos thought he had a chance to earn a medal in 1956 after finishing second at the Olympic trials in Los Angeles. But Greek vaulter Georgios Roubanis edged him for third place in Melbourne. The bronze medalist used a fiberglass pole that gave Roubanis an advantage over the rest of the vaulters who used steel poles. 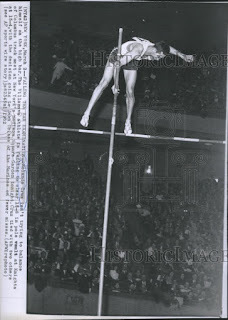 "So I lost the bronze medal to the first fiberglass pole ever used in the Olympic Games," Mattos told the Mail Tribune. "It was definitely unfair, but there was no rule against it." 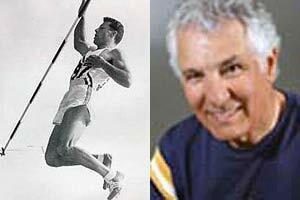 Mattos retired from pole vaulting in 1960 after failing to qualify for the Rome Games. He did clear 15 feet with a steel pole before leaving the sport. Mattos never used a fiberglass pole. The Olympian stayed active by playing tennis and skiing. He also climbed Mount Shasta five times according to a 1983 story in the Redding Searchlight. Mattos spent several years working weekends for the U.S. National Weather Service. But his real passion was music. Mattos worked in big bands, jazz combos, Dixieland and concert band throughout his life, including at San Jose State and while serving four years in the Air Force. He was the leader of the Dixie Fat Cats Dixieland Band that played at the Medford Jazz Festival for 10 years. Mattos started teaching music in 1956 at the elementary and high school in Weed. In 1960 he helped start the music department at newly opened College of the Siskiyous. "People think sports and music are a weird combination," he once told a reporter. "People say I should be a track coach. I don't have any desire" to coach. "I didn't want to spend my life in a smelly locker room," Mattos added. "So many people in athletics never mature. Music is more mature. Music has more appeal. It's so alive, so vivacious. He is survived by his second wife Lorraine Mattos of Central Point, Ore., his brother Rick Mattos, first wife Ginger Mattos of Mount Shasta; children Diana Gilley of Medford, Rob Mattos of Menlo Park, Dave Mattos of Haiku, Hawaii, Karen Kozak of Phoenix and Linda Mattos of Bellevue, Wash., and four grandchildren. The George F. Mattos Music Scholarship had been established in his name at College of the Siskiyous, where he worked from 1960 to 1989. Contributions can be sent to the COS Foundation, 800 College Ave., Weed 96094, or by contacting Dawnie Slabaugh at 530-938-5373 or slaubaugh@Siskiyous.edu. *Cornelius ("Dutch") Warmerdam (June 22, 1915 – November 13, 2001) was a long time pole vault world record holder and is considered to be among the all time greatest vaulters. Dutch got his start in pole vaulting in his backyard using the limb of a preachtree and landing in a pit of piled up dirt. He grew up in the Hardwick area and graduated from Hardwick Grammar School ca 1928. He was discovered by the local track coach and vaulted for Hanford High School until his graduation in 1932, after which he attended and vaulted for Fresno State University. Dutch married Juanita Anderson, a 1937 Laton High School graduate, on August 29, 1940, and they were married for 61 years until Dutch's death in Fresno in 2001. Juanita continued to live in Fresno until her death in 2006. 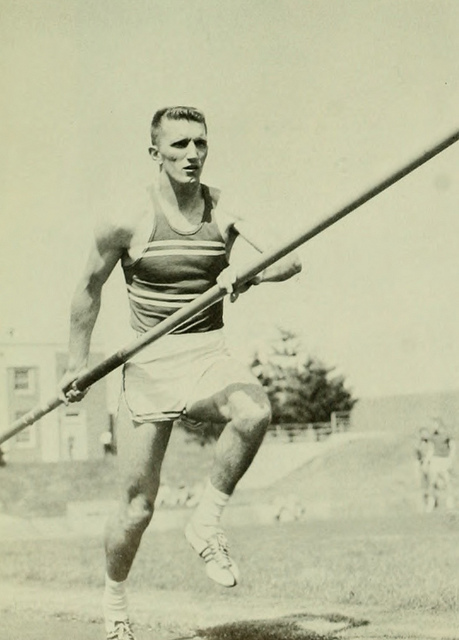 Vaulting throughout his career with a bamboo pole, Warmerdam was the first vaulter to clear 15 feet (4.57 m), accomplishing that feat at UC Berkeley on April 13, 1940. However, that achievement was not ratified for a world record, and his later vault of 4.60 m on June 29, 1940 was the first ratified jump over 15 feet. During his career, Warmerdam vaulted 15 feet 43 times in competition, while no other vaulter cleared the mark a single time. Warmerdam surpassed the pole vault record seven times in a four year span, and three of those marks were ratified as world records. 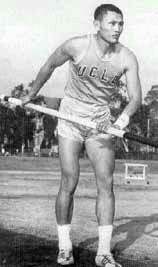 His highest outdoor vault was 15' 7-3/4" (4.77 m), achieved at the Modesto Relays in 1942, a record which stood until 1957 when Bob Gutowski broke the mark using a metal pole. Warmerdam won the James E. Sullivan Award in 1942 but was never able to compete in the Olympics because the 1940 and 1944 games were cancelled due to World War II, and by 1948 he was coaching professionally and therefore ineligible. However he continued competing as an early practitioner of Master athletics. He still is ranked in the world all time top ten list in the M60 Decathlon. 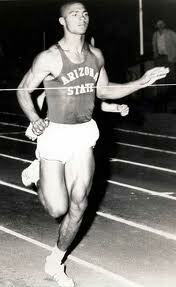 Dutch went on to coach track and field at Fresno State College until his retirement in 1980. Fresno State named its track stadium Warmerdam Field in his honor. Dutch is a member of several halls of fame, including the National Track and Field Hall of Fame and the Millrose Game Hall of Fame. Thanks to Pete Brown (see below) of Plano, Texas who has been kind enough to loan us his collection of 1963 T&FN issues, the missing year is missing no more. Indoor meets abound. Sixteen are reported in this issue. We will run through them chronologically. I think we have covered the part about Bruce Kidd being real good in last month's report. How good? Good enough to run a the second fastest three mile ever, 13:34.6, while lapping the field twice. This should be enough to have the 12,625 in attendance talking about the hometown boys as they depart the stadium. But it isn't. The subject of conversation is Dave Tork who has just taken the pole vault indoor world record from Finland's Pentti Nikula with a leap of 16-2 ¼. If you recall, C.K. Yang had set the record a week ago in Portland only to have Nikula wipe his name from the books the next night. 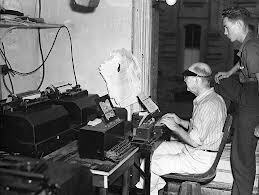 Your editor was 19 year old sophomore at U. of Oklahoma in Feb. 1963, and at an indoor meet in Lubbock, Texas C.K. Yang was vaulting as the current WR holder. Next day in the hotel lobby I picked up a newspaper that had a story announcing that Yang had just become the former WR holder. C.K. was in the hotel restaurant that Sunday morning, and I gave him the paper opened to the story. He didn't seem too surprised. That winter , the record changed hands almost every weekend. Six days later, it belongs to Tork. The fiberglass pole has just been approved and vaulters are becoming accustomed to it. Records aren't held, they are borrowed. 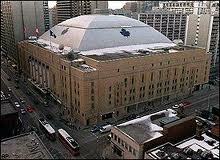 The next night we are in Winnipeg and as good as the PV was last night, it isn't tonight. J.D. Martin wins on misses over Don Meyers and Jerry Morro at 14-0. John Rose opens at 15-0 and no heights. What is going on? Well, it seems that the poles were stored outside. This may work in Los Angeles, San Diego and Miami. Not so much in Winnipeg. The vaulters are reduced to working with frozen poles that have no more bend than the steel poles of yesteryear. J.D. Martin was the biggest man ever to clear 15' feet on a steel pole going about 15'7" maybe a little better. He was 6'3" and well over 200 pounds. The fiberglass technology of the day was insufficient to build a pole that could safely hold J.D. It would have had to weigh at least 50 pounds, so he could never progress on glass. Fortunately for J.D. 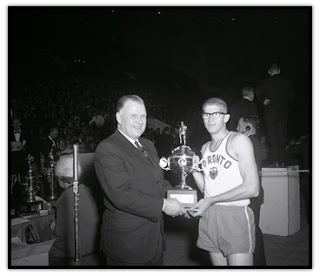 he had multi talents and went on to win the Pan Am games decathlon in 1963. 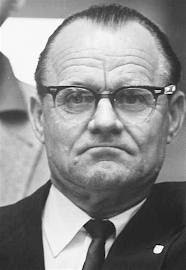 By 1964 he was offered the head coaching job at Oklahoma (an offer he couldn't refuse) and stayed there 37 or more years. Taking the job, cost him a shot at making the Olympic team in '64. ed. The 74th Boston AA Games are held the same night. Yale's and Jamaca's Wendell Motley thrashes the 440 field by a second and a half with the fastest 11 lap to the mile track time of 48.3. Morttley will go on to put his Yale degree to good use, becoming the Minister of Finance for Trindad and Tobago from 1991-95and recently named Chairman of the Board of the Trinidad and Tobago Unit Trust Fund 2013. ed. When Dave Tork leaves the stadium he is still the world record holder, but he is not the winner of this evening's competition. That would be John Belitza of Maryland who becomes the sixth member of the 16 foot club by half an inch. Rolando Cruz is second at 15-6. Tork is third at 15-0. The next week track and field is alive and well in the Millrose Games held in Madison Square Garden. The main attraction is the arrival of the Russians, world record holders Igor Ter-Ovanesyan and Valeriy Brumel and middle distance runner Valeryi Bulishev. Brumel traditionally has had an easy time of it with America's best, John Thomas. This time it is a bit tougher as Thomas leads on misses at 7-0. The Russian regains the lead at 7-1 and then jumps 7-2 to win. History is not on Ter-Ovanesyan's side. In eight competitions against the top American broad jumper, he has yet to win. Tonight's dual with Ralph Boston will be their sixth. T-O has yet to win. After Boston's first round 25-10 provides him a 2½ inch margin, it appears to be more of the same. But this time things are different. T-O demonstrates why he is the world record holder with a second round indoor world record of 26-10. Not only can Boston not match that, he can't find the board. Four of his last five jumps are fouls and the Russian wins by a foot. Bruce Kidd spends his lonely hours on a Friday evening winning the two mile over an improving Charlie Clark in 8:41.0. Clark's 8:46.0 is the new American record, surpassing the 8:47.1 of Max Truex who was third this evening in 8:46.2. (As a notation for further reference, Billy Mills is sixth in 9:21.6.) Tom O'Hara nips Cary Weisiger in a spirited mile, 4:01.5 to 4:01.8. No splits are given. The Russian tour will continue next week in Los Angeles and two weeks later back at the Garden for the AAU Nationals. Now it is the next day, Saturday, February 2. Remember that pole vault world record thing? Well, it is back. 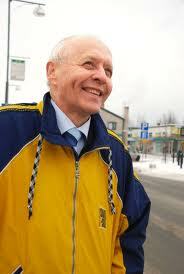 In Pajulahti, Finland, Pentti Nikula becomes the first five meter man with his 16-5 jump. Most of the 900 fans rush the floor. Pandemonium reigns. His coach, Valto (great name for a PV coach) Olenius, is lifted into the air. Backs are slapped, hands are shaken. The world record is back in Finland. But rather than trotting off to the pub for a few cold ones, Pentti wants to try 16-6¾. After two failures, he clears. Why quit when you are hot? The bar is raised to 16-8¾. Over he goes on the first try. Two attempts at 17-0 go awry and Pennti is done for the night, secure in the knowledge that the WR is his. But remember the record can't be owned, only borrowed like a library book that has to be turned in in two weeks. Still and all, it is a pretty good night. On the same evening at the Philadelphia Inquirer Games, Rolando Cruz of Villanova becomes the newest member of the 16 feet club, doing so with half an inch to spare. Just for fun Bruce Kidd drops down to the mile and handles Tom Sullivan 4:08.7 to 4:10.2. A week has passed. It is February 9 and the promised LA Times meet is upon us. Let's start with the duals in the jumps. Valeryi Brumel's coach said he isn't in world record shape and indeed that is so. He takes three jumps to clear 6-8. John Thomas makes 6-10 on his first effort. Brumel takes two tries. Both clear 7-0¼ on their third attempts, but can go no higher and Thomas wins on misses, his first victory over Brumel in eight tries. In Brumel's defense, he has stepped on a TV cable and injured himself early on. His coach gives him credit for competing. Ralph Boston and Igor Ter-Ovanesyan have at it again in the broad jump. The lead changes hands four times before the Russian pulls out a 26-3 to 26-1½ victory. Herb Carper destroys the 60 field with his fifth world record equaling 6.0. The 6.0 club includes Jim Golliday, Charlie Tidwell, Roscoe Cook, Frank Budd, Dave Styron, Ralph Alspaugh and Brooks Johnson. Please, somebody run 5.9. Hayes Jones runs the 60HH in his best time of the year, 7.1. More significantly, this is his 39th straight hurdles win, breaking Harrison Dillard's record. In the absence of Bruce Kidd, Bob Schul takes the two mile easily in 8:51.6.
against the great Peter Snell. Can he pull the upset? No, not close. He finishes well back in 4:12.7. But this is not to say there isn't an upset. Jim Grelle follows through a 2:02.5 half and takes over at the ¾ mark in 3:05.8. Snell is sitting 20 yards back and the crowd anticipates what is about to happen. It is only a matter of time before the king of the kick takes over. Or is it? Grelle looks around several times on the last lap for the Kiwi's challenge. It doesn't come. Grelle takes it easily 4:04.7 to 4:06.4. No explanation is given. Friday, Feb. 15 finds meets on opposite sides of the country, the Golden Gate Invitational and the more significant New York AC Games which feature the touring Russian road show of Brumel and Ter-Ovanesyan. Thomas and Boston are not the competition tonight, but this is not a problem for either Russian. T-O leaps 25-6¾ and Brumel after a dismal showing last week, rights the ship to clear 7-4 for an indoor record. Michel Bernard, the French record holder at two miles, is here to give 19 year old Bruce Kidd a run at this distance. He follows Kidd through half mile splits of 2:08.5, 4:20.8 and 6:33.2 at which point he is five yards down, ready to pounce. Kidd, who should be hanging out at the malt shop on Friday night, never gives him the opportunity. He closes in 63.2 and 62.6 to finish in 8:39.0. Bernard runs 8:41.4. In San Francisco the competition is, well,......whimsical. There are four sprints, the 60, 50, 25 and weightman's 60. Herb Carper wins the first two, but the fun comes in the 25 when he lines up against fast starting Hayes Jones. Make that fast starting for a hurdler, Hayes Jones. Jones is no match for Carper who blows him away by a yard, 3.1 to 3.2. There will be a weightman's 60, but Parry O'Brien ain't running with the fat boys. No, he runs with the sprinters and is fourth at 3.5. Jack Yerman is having a heck of an indoor season at 600. He drops to the 440 tonight and leaves Ulis Williams in his dust, 48.4 to 49.2. 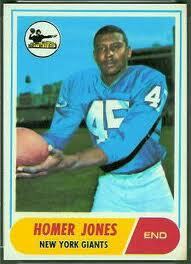 The aforementioned Mr. Jones runs his consecutive hurdle victory streak to 40 with a 7.1 clocking in the 60. Charlie Clark drops his 2M PR by two tenths to 8:45.8 thanks in great part to the 8:47.3 of San Jose State sophomore Danny Murphy. The following night, Saturday, Feb. 16 and we are in the south for two vastly different meets. The first SEC meet is held in Montgomery, Alabama and the talent level among the competing schools is diverse. LSU wins with 30 points followed by Alabama 27. Mississippi State 25 and Auburn 24. None of the other seven schools score more than seven. In fact Mississippi and Vanderbilt take a goose egg. Marks are inferior to comparable size conferences. The high jump is won at 6-2, the mile relay at 3:31.1, the PV at 14-0, the mile at 4:28.7 and the two mile at 9:51.1. Integration has yet to come to the SEC. In contrast, the Mason-Dixon Games in Louisville produce four world records. Bob Hayes has just returned from Jamaica where he tied the WR for the 200 meters on a turn at 20.5. He takes down the WR for 70 yards at 6.9. The other three records are aided by the Freedom Hall 220 yard track. 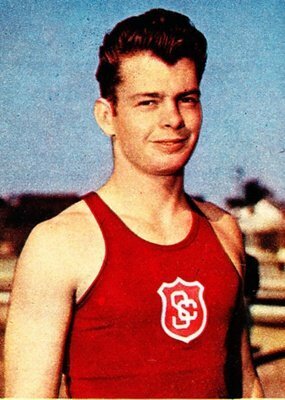 As the runners wait for the gun in the 500, the WR is Charlie Jenkins' 56.4 set in 1956. One minute later and the record belongs to Earl Young who has knocked off a 55.5. 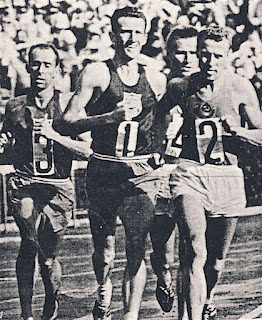 Had Earl not been there, the record would have been broken anyway as Dave Mills, Ollan Cassell and Willie Atterberry all finish in 55.6. Texas Southern and Georgetown have been waiting for this meet. The TSU guys obliterate Oklahoma State's 3:13.8 mile relay record with a 3:12.2. No one has split over 48.5 and Ray Saddler anchors in 47.2. The two mile relay WR falls to Georgetown in a race which is apparently timed by a watches with no tenths. The Hoyas run 1:55.0, 1:54.0, 1:50.0 and 1:50.0 for a time of 7:29.0, clipping two tenths off Kansas' record. The last two legs are run by Ed Duchini and John Reilly. Now we have returned to the Big Apple for the AAU Nationals where foreigners take home four American titles. Brumel handles Thomas 7-3 ½ to 7-0. Ter-Ovanesyan leaves no doubt that he is the world's best broad jumper by leaving Boston behind 26-6½ to 25-9¾. Bill Crothers returns to Canada with the US 1000 title after a 2:09.8 go round after numerous US talents don't survive the heats, among them Ernie Cunliffe, John Reilly and Cliff Cushman. The other non-US taxpayer with a title is Michel Bernard who cruises to a 13:38.4 win at 3M, narrowly escaping the kick of Bob Schul who finishes four tenths back. Jack Yerman is the man this season at the 600 and proves it by running 1:09.4, only a tenth off George Kerr's record. Much credit for this goes to Norfolk State's Jim Johnson who leads until the final straight and finishes only a tenth back. One can only wonder how fast this might have gone without the earlier heats. Jim Beatty runs a similar race to that in LA two weeks earlier, hitting the 1320 in 3:00.0 and finishing in 3:59.0, a second ahead of Jim Grelle. Who holds the Tulane University record in the high hurdles? 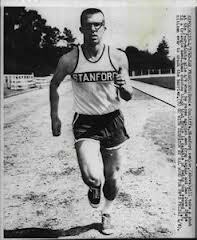 That would be noted radio and TV commentator Howard K. Smith who ran 14.5. in 1936. Howard K. Smith, a 1936 graduate of Tulane University, was named one of the NCAA's 100 Most Influential Student-Athletes in 2006. As part of the NCAA's Centennial Celebration, a panel consisting of college and university presidents, athletics directors, NCAA committee members, conference office representatives, SAAC representatives and NCAA staff determined the prestigious list which celebrates each honorees professional accomplishments, athletics success and scope of achievement. Smith was a longtime newsman whose career began as a foreign correspondent for UPI in 1940. 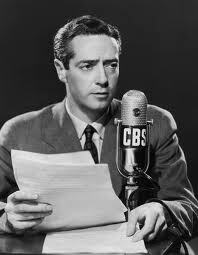 He joined CBS News in 1941 as its Berlin correspondent and covered many pivotal moments of the war, including the German surrender to Russia as well as the Nuremberg trials. In 1960, he was named chief of CBS's Washington Bureau and continued to build his impressive resumé, including serving as moderator of the first Kennedy-Nixon presidential debate. He would move on to ABC, hosting numerous news programs and was named co-anchor of the ABC Evening News, a position he would hold until 1975. He was also the author of four books, including the best-selling Last Train From Berlin, which chronicled his views of the conditions in Germany prior to his departure in 1942 - he was recognized as the last American correspondent to leave Germany after war was declared. 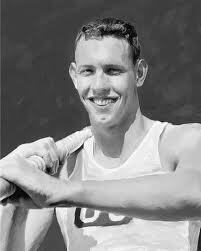 As a student-athlete at Tulane, Smith earned three track letters and was captain of the team as a senior in 1936. He still holds the Tulane record in the 120-yard high hurdles at 14.5 seconds and was inducted into the Tulane Athletics Hall of Fame in 1983. He served as his class president for his sophomore, junior and senior years and also wrote for The Hullabaloo student newspaper and the Jambalaya yearbook. A Rhodes Scholar, he attended Heidelberg and Oxford after graduating from Tulane. Smith held honorary degrees from Tulane (LLD in Journalism, 1955), Maryland, Alfred, Thiel, St. Norbert, Roosevelt and Southern University. 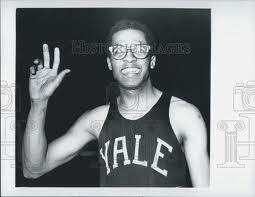 He also earned multiple honors from the NCAA, including being honored in 1972 with an NCAA Commemorative Plaque as one of a group of newsmen who achieved national prominence in the field after having won a varsity athletic letter. Born May 4, 1914 in Ferriday, La., Smith was married and had two children. He died on Feb. 15, 2002.
Who is Pete Brown? Below a brief intro that Pete sent to me two years ago. His devotion to and knowledge of Track and Field is profound. 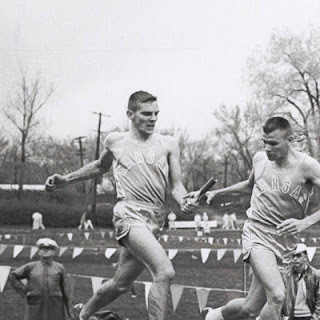 George---I ran for UNM 61-62-63 and was only good enough to place 2nd or 3rd in conference (PR 1:52.1 880 in Tempe the night Plummer ran 44.9 and smashed WR) and I never ran after college. I missed Q for 63 NCAA in ABQ by .2. I got married after my soph year and only did 10k type stuff after that. I saw my first big-time meet in the Coliseum in 1950---USC, Yale and Michigan State and have been a fan ever since. I have boxes and boxes of track “stuff” I’ve collected over a lifetime and still go to the NCAA meets.